Between Lock 10 and Lock 12 the canal runs alongside the grounds of Marple Memorial Park. 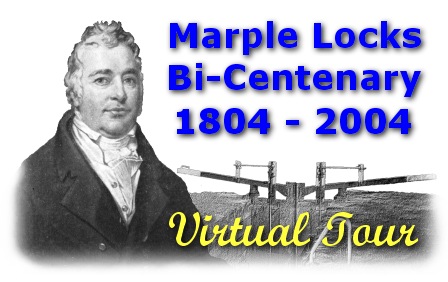 This land was gifted to the people of Marple by the Carver family, who owned Hollins Mill, as a memorial to the 141 Marple men who died in the First World War. The laying-out was done by public subscription and the memorial itself was originally dedicated on 22 July 1922. It was extended again after WWII, during which 50 more local men lost their lives. Lock 12 was another busy area. Moult's Timber Yard and Workshops were situated here so that their supplies and products could be transported using the canal. The area alongside Lock 12 pound opposite the towpath and now occupied by the bungalows for the elderly was once the site of a coal wharf called Black Wharf. Less than 100 yards towards the centre of Marple along Stockport Road is the Navigation Hotel, a fine place to stop for refreshments. This is one of the original five 'Navigations' on the Peak Forest Canal and was owned by Samuel Oldknow after he purchased it from Richard Arkwright in 1791. He used it as a brewhouse to produce free ale for his workforce at the Lime Kilns and for the many Irish navvies constructing the Peak Forest Canal. What a great employer he must have been! This photograph looking at Lock 14 from Lock 15 locktail bridge, we think taken in the sixties, shows a much harsher scene than the present-day shot below, which has been softened by the growth of trees and shrubs. The road running alongside the canal from Posset Bridge on Stockport Road to Top Lock is called Lockside. On the opposite side of the canal, at Lock 13, Lock 14 and Lock 15 are extra large pounds for water storage to minimise loss during operation of the locks. In days long gone, when the Lime Kilns were operating, these pounds would also have been used for boats to queue whilst waiting for their turn to access the lime loading sheds. Lock 16 is better know as Top Lock, a name given to the whole area, rather than just the lock itself. In the panoramic shot below Top Lock House dominates the view from Bridge number 1 of the Macclesfield Canal. It was originally built by Samuel Oldknow, who had a boat-building yard adjacent, and it's thought that the manager of the yard first lived in the house.